A spit is a stretch of beach material connected to mainland at the proximal end and projecting out into a water body at the distal end. A spit is a coastal landform, a stretch of beach material that projects out to the sea. It is connected to the mainland at one end. A spit thus has two ends. The end jutting out onto the water is called the distal end, and the one attached to land is called the proximal end. Spits are usually formed when longshore currents producing a longshore drift strike the beach at an angle. This usually happens in the case of a sheltered beach or shore like that of a bay or cove. As the longshore current moves at an angle, and changes direction, the current spreads out and loses much of its energy. The dissipation of energy renders the waves incapable of carrying a full load of sediments, and thus sediments are deposited in the form of a long bar-like feature off the coast or shore of the mainland. In this way, a spit is formed. Does A Spit Continue To Grow? As the longshore drift will continue to deposit sediments where the waves are breaking, the spit will continue to rise. The spit will also continue to extend into the sea but not indefinitely. The process stops when water pressure, like that from a river draining into the ocean, is too high to allow the sediment deposition to continue to occur. Over the years, life begins to bloom on a spit. Vegetation starts growing, and the spit might also become a fertile landform in the future. The water behind the spit landform is sheltered from wind and wave action, and this results in a salt marsh habitat. Such habitat allows the growth of only salt-tolerant vegetation and often attracts birds to them. Do The Spits Last Forever? Several factors determine the longevity of a spit. When waves arrive in an opposing direction to that of the waves creating a spit, it might damage, shorten or completely destroy a spit. Any changes in the source of sediments that are deposited in a spit will also affect the growth and longevity of the spit. The sediments usually arrive from sources like eroding bluffs and rivers. Changes in the sediment source will thus affect the sediment deposition in a spit and either increase or decrease the size of a spit. Human activities like farming or logging that increase the load of sediments deposited in a spit might adversely affect the intertidal environments surrounding a spit. This might destabilize the delicate habitats in the area. The construction of roads and other developmental activities on bluffs that supply sediments for a spit might result in a lesser volume sediments being deposited and a consequent loss of the spit feature. A spit might give rise to new landforms after a period of time. For example, if the sediment supply to the spit is interrupted, the sand at the neck of the spit (the end towards the mainland) might be moved towards the head of the spit. This process might give rise to an island. A spit might also continue to grow in length and join mainland at the other end. The newly created landform which is joined at both ends to land is called a bar. The part of the sea behind the bar is a lagoon. If there is an island in the vicinity of the spit, and the spit grows in a manner that it connects the islands to the mainland, the connecting feature is called a tombolo. The Arabat Spit is the longest spit in the world with a length of 112 km. 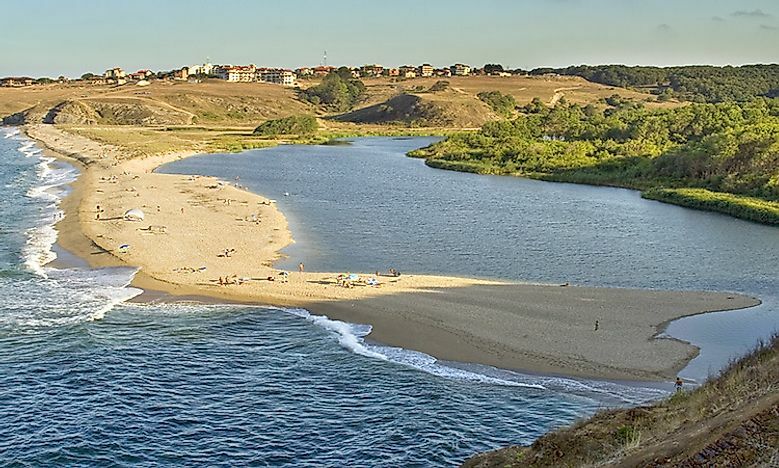 The spit separates the Sea of Azov from a system of shallow and brackish lagoons known as Syvash. The Arabat Spit stretches from the north-eastern shores of Crimea to the south to the Henichesk Strait to the north. The Long Point Spit is the longest spit on a freshwater body and extends for about 40 km from the northern shore of Lake Erie in Ontario, Canada. The spit is 1km wide at its widest point. Other notable spits are the Spurn Point in the UK at the mouth of the Humber River, the Farewell Spit in New Zealand, the Curonian Spit off the coast of Lithuania, and others.